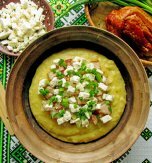 Banosh is one of the most popular Hutsul dishes in Ukraine. By tradition men usually cooked it in the open air. Banosh is considered to be one of the variants of mamaliga. 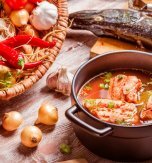 The tastiest banosh cook in Carpathians. 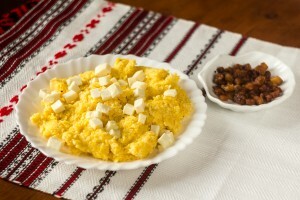 Historically the main components of banosh were sour cream and brynza. The sour cream was kept 3 days in a cellar before cooking. However you can cook not less tasty banosh at home too. 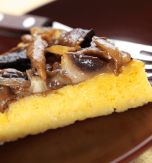 Follow the recipe to make yummy maize grits with salty cheese. Bring water to boil and reduce the fire. Add maize grits stirring them continuously. Be careful the water will gurgle. Then add sour cream and stir the dish for 20-30 minutes. Turn off the fire, cover the lid and leave banosh for 5 minutes. Crush brynza and top the cooked dish with it. Tip! 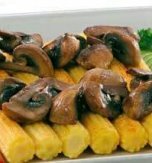 As a side dish you can serve cracklings and fried mushrooms. It is better to use the homemade sour cream while bought in the shop sour cream is sourer. Use a wooden spoon to cook the dish while the metallic one can leave acid after-taste. Boil banosh in a loam pot or kettle. It is better to use fine flour or grind it in a coffee-grinder. Do you have a favorite Ukrainian recipe for maize grits with salty cheese? If so, please let us know in the comments below or write us an e-mail. 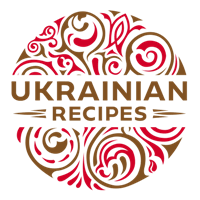 Ukrainian banosh – Why do you need to fall in love to cook this national dish?